While wandering through the frozen food aisle at Trader Joe’s post-holidays, I came across lobster tails. And at a typical Trader Joe’s low price — score! 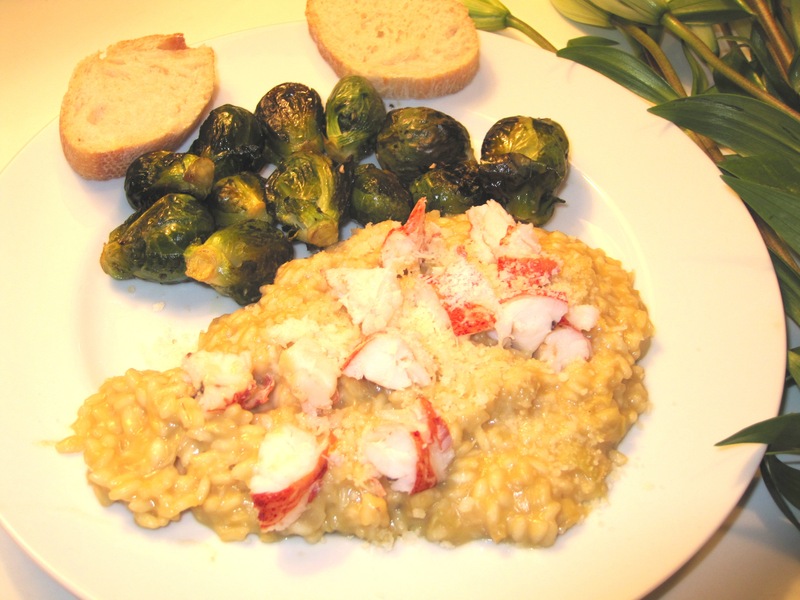 I immediately began plotting to make artichoke and lobster risotto, a recipe I’d learned during an awesome culinary boot camp weekend at Kendall College. Unfortunately, we’d worked in pairs on that one, and my partner was a little greedy with the mixing and the stirring (basically, she let me ladle in the broth and cut up the lobster) so I’d actually learned very little. But the end result was delicious, and I hadn’t shared the leftovers with Mike after class because, well, did I mention it was delicious? Lobster tails in hand, I decided it would be the perfect dish for our 18-month anniversary dinner. I should add that my only other risotto-making experience involved barley and a recipe I half wrote down from an odd Canadian cooking show during my days in Detroit. Also good but, obviously, much different. On the night of our anniversary, Mike arrived home to find me at the stove, 15 minutes into what turned out to be 30 minutes of steady stirring (in figure 8s, I’d gleaned that much from class). He asked if I’d received some texts he’d sent, that I hadn’t answered. Because of all the stirring. “Don’t they have a machine for that?” he asked as I moved aside so he could toss the brussels sprouts roasting in the oven. I kept up with my figure 8s and made a mental note to research, and perhaps invent, some sort of risotto-stirring machine. Although one probably isn’t necessary. Less than 20 minutes later, we were on the couch feasting. Well, I was feasting. He was trying to capture a photo of our (delicious) meal for this post. 1. Rinse and chop artichokes. 2. Steam lobster for 8 to 10 minutes, until meat is opaque. (Mine took 8.) Cool for 15 minutes, then cut through the top shell lengthwise, remove the meat, and cut it into 1/2-inch pieces. Set aside. 3. Place chicken stock in a medium saucepan and bring to a boil, then simmer over low heat. 5. Remove risotto from heat and stir in the parmesan cheese, the remaining tablespoon of butter, and 2 tablespoons of chives. Season with salt and pepper. Transfer to a bowl or platter (I just plated ours) and top with lobster and remaining chives. *Complete credit to Kendall College for this recipe.